75 lbs. 3/4 extension variable height keyboad slide with 1/2" side space. Used with computer keyboards, writing and typewriter shelves or anywhere an adjustable height shelf or shallow drawer is suspended over or under a work surface. 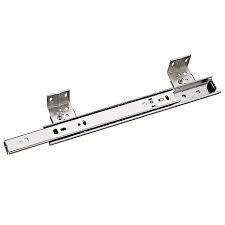 Features steel ball bearings, detent in and out, lever disconnect and silencing in and out.